While Aadhaar-PAN linking will be mandatory for filing income tax returns, it will also be required for obtaining a new PAN. Linking of Aadhaar with PAN or Permanent Account Number has been made compulsory for filing tax returns. While Aadhaar-PAN linking will be mandatory for filing income tax returns, it will also be required for obtaining a new PAN. 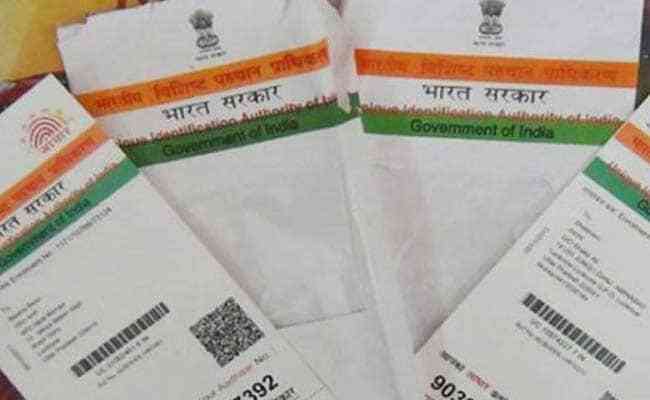 Aadhaar, a 12-digit identity number based on biometrics, can be linked with the PAN, a 10-digit alphanumeric ID number for tax returns, in a number of ways. The Income Tax Department has lately come out with many communications asking potential taxpayers to carry out Aadhaar-PAN linking. Among the latest moves by the taxman to encourage Aadhaar-PAN linking was an email received by many individuals. In the email, addressed to the taxpayers, the Income Tax Department's e-filing team said: "As per section 139AA of the Income Tax Act, 1961, it is mandatory for taxpayers to link their Aadhaar with PAN for filing Income Tax Return from 1-July-2017." 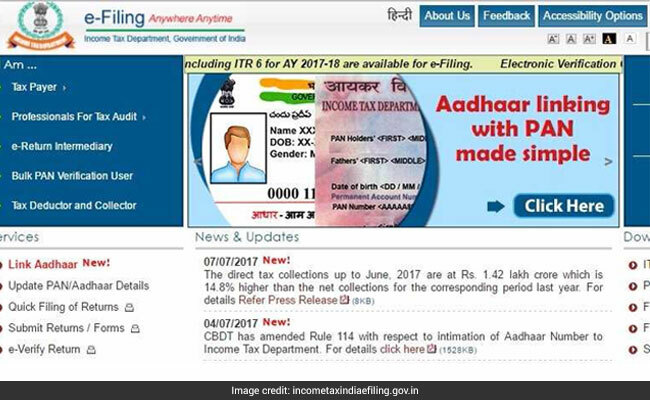 The e-filing team also mentioned two ways on the income tax e-filing portal - incometaxindiaefiling.gov.in - to link Aadhaar with PAN: by using 'Link Aadhaar' under the services section on home page and by using 'Link Aadhaar' under 'Profile Settings' after logging into your e-filing account. While the first option is for users unregistered on the e-filing website, the second is for registered users having login ID. Spot and click on the new 'Link Aadhaar' hyperlink on the left hand side of the income tax e-filing website. Fill details in the respective fields, follow instructions and check the 'Request OTP' option. Click the 'Link Aadhaar' button at the bottom of the form. "Enter Aadhaar no. and ENTER NAME EXACTLY AS GIVEN IN AADHAAR CARD (avoid spelling mistakes) and submit," the Income Tax Department has said in an earlier communication. 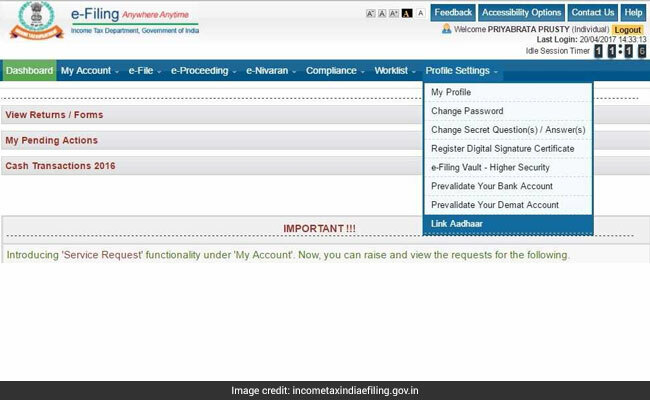 Once you are logged into the e-filing portal, spot the 'Link Aadhaar' option under 'Profile Settings'. 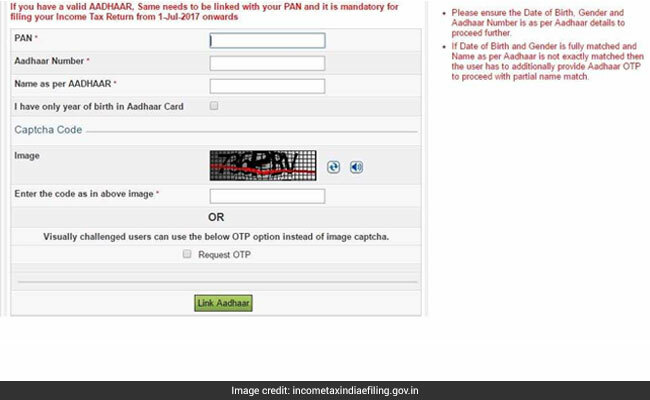 In case your Aadhaar is already linked with PAN, 'Link Aadhaar' section displays the following message. The Income Tax Department had earlier sent SMSs to some taxpayers asking them to link Aadhaar with PAN. The SMS read: "Aadhaar linking with PAN is mandatory for filing of Income Tax Returns from 1-July-2017. Please visit www.incometaxindiaefiling.gov.in and Link Your Aadhaar."